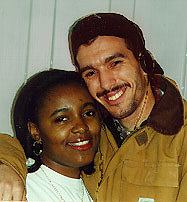 Phillipa Johnson ’99 (left) poses with SoCA founder Frank Rosado ’96 (right). The formation of SoCA was spear-headed intially by Frank Rosado ’96 and other Caribbean affiliated students in the classes of ’95 and ’96. Despite the efforts of Rosado, the organization initially languished – due to low membership, as well as a lack of recognition and thus, funding from the Minority Coalition (MinCo). In the spring of 1995, anticipating recognition from MinCo and an ever increasing Caribbean and Caribbean-American population, SoCA resolved to increase its campus activities and profile. In its first active years on the Williams campus, Students of Caribbean Ancestry passed a number of important milestones. From creating a constitution, participating in the annual North East Regional Caribbean Students Conference, hosting its first ever Caribbean Heritage weekend (Spring, 1996) and a subsequent Caribbean week the following year, SoCA has continued making strides towards sponsoring events that have educated, entertained and otherwise satisfied its continually increasing membership. In more recent years, SoCA has been predominately focused on gaining attention on the Williams College campus; hosting parties and weekly movie screenings play only small roles in the larger production. SoCA aims to be connected to the masses – student groups and non-affiliates alike. We hope that one day we will be able to solidify our place at Williams with an unwavering foundation and a strong membership base. *For more on SoCA’s history visit the Our History tab. Thank you!